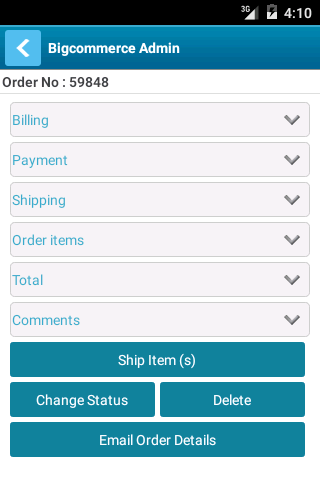 BigCommerce Admin Mobile App is an android application that use BigCommerce Standard API. 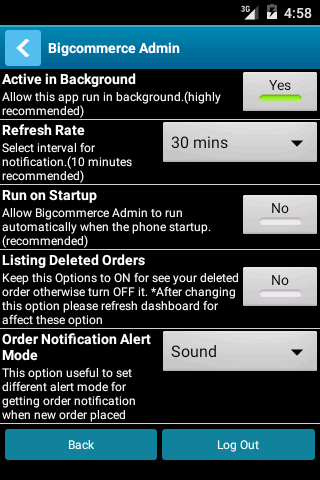 This App is an easy tool to manage your orders of BigCommerce Store from your Android Device. It will give you almost every control on the orders without installing any plugins or birdge. You just have to create a Legacy API Account from your bigcommerce store admin. You will get API username, API path and API token (key) from created API account. This detail used for login into Bigcommerce admin mobile app. Complete orders listing of store. You can search orders using order id, with customer details like firstname, lastname and email id as well as order dates in range. You can filter orders using status (For example, Incomplete, Pending, Shipped, Completed, All Orders etc.). You can view order dates as well as data as per device timezone. 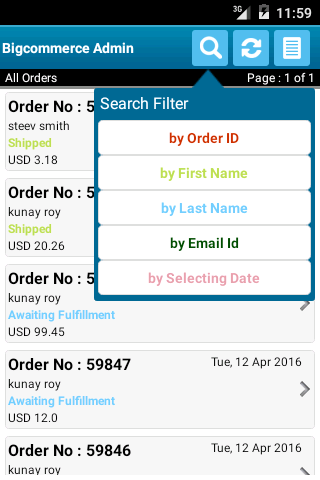 View each order complete information like billing details, shipping details, order items, totals and also comments. You can change order status from order detail page. 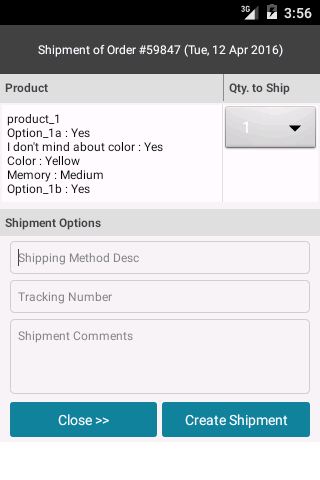 You can create shipment from order detail page with selected product quantity. You can email order details to other email address in pdf format. Get new orders notification as per time set into Settings page. Before you install app, you need login details of API Account so you have to create a legacy API account in your store admin. 1. Click on Advance Settings in menu bar. 2. Select ‘Legacy API Settings’. 3. Click on Create a Legacy API Account button in Legacy API Accounts page. 4. Now, Form of creating Legacy API Account will open. Enter Username in form. Api path with store url is already given. If you want to generate new API token then click on Generate New Token button. Then click on Save button to save this details. You have to use this details to login into Bigcommerce Admin App. 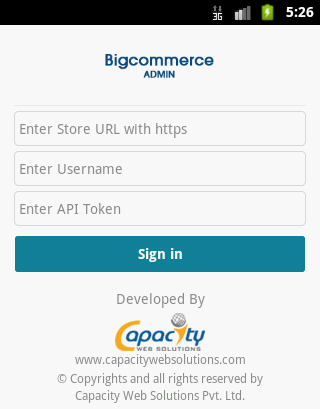 Now Download the BigCommerce Admin Application from google play store and install it. Login page will be displayed when you open the App. Enter your store URL (not API path), API username and API token. Then click on Sign in button to go to dashboard. Dashboard page will display list of All orders by default. It shows pagination of 20 orders per page. Here, the list of orders is displayed with order no, order date, customer name, order status and also order total . When you click on any order in list, you will redirect to order detail page of that selected order. There is a settings icon in header of dashboard page. When you click on it, settings page will be displayed. When you click on search icon , you will see search filter. You can refresh list of orders by clicking refresh icon . 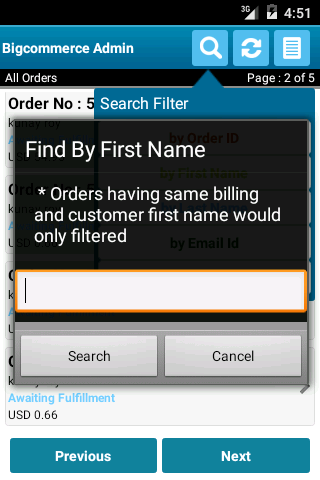 There is a order status filter to filter orders with status. Click on icon. You will see all the status list of orders. Now let’s go through search and filter options. 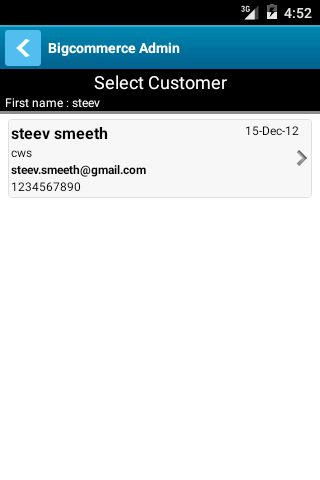 You can search orders using order id, date range of orders and customer details like firstname, lastname and email id. When you click on any search option, then you need to enter details which you want to search. When you click on by First Name, by Last Name or by Email Id then popup will open with a note. Note is that ‘Orders having same billing and customer first name/last name/email id would only filtered’. It means that orders which have different customer name and billing name can not be found by this search options. 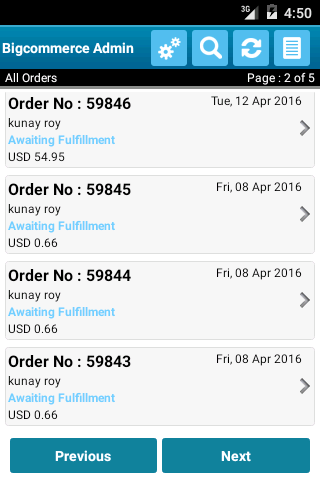 Orders of same details of billing and customer who have placed order are only displayed after search. When you entered proper search details in customer detail options (by First Name, by Last Name or by Email Id), you will redirect to a new customer dashboard. Customer Dashboard will display list of customers having searched detail. Each record shows customer name, email id, company name etc. 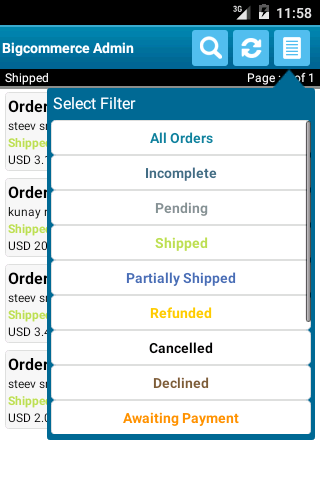 You can filter orders by its status like Incomplete, Shipped, Declined, Completed etc. When you click on any status option then dashboard page will only display orders of that selected order status. 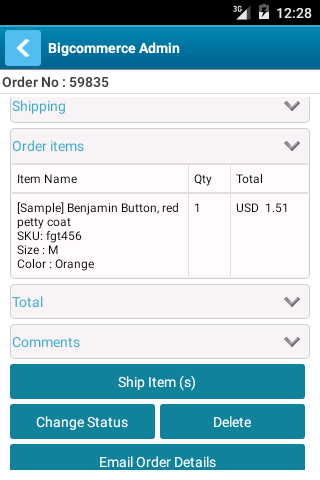 Order detail page shows order details like billing and shipping information, payment information, ordered items, totals as well as comments. Each detail has a separate section so you can see it very easily. Billing/Shipping section will display customer billing/shipping name and address with some extra details. Payment section will display payment method and payment status. Order items section will display ordered items with their quantity and totals. Total section includes Subtotal, Shipping Cost and Grand Total. Comments section shows comments which is written for a given order. There are four buttons placed below of this page. These buttons are for creating shipments, changing status, deleting order and sending email of order details. When you click on Ship Item(s) button then new page of create shipment form will open. When you click on Change Status button then list of all status will displayed. Click on delete button for delete order from your store. Click on Email Order Details button for sending order details email in pdf format. Once you click on Ship Item(s) button then this page will open. You can select product quantity and enter details like shipping method, tracking number and comments of shipment. Then if you click on Create Shipment button then shipment will be created. If you click on Close button then you will go back to order detail page. 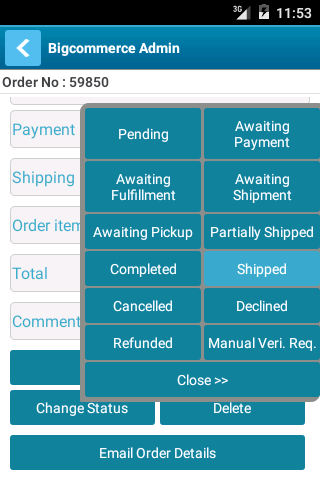 When you click on Change Status button then list of all order status will be displayed. If you click on any order status from list then status will change as per your selection. If you click on Close then status list will be closed. When you click on Settings icon displayed in Dashboard page then this page will be displayed. All settings of this app are configured into this page. You can enable/disable notification from here. You can set time and sound settings for orders notification. You can have option for displaying or not displaying deleted orders in list of dashboard page. By clicking on Logout button (placed right side below), you can exit from the application.